The following review is for a product called Swanson 7-Keto DHEA. It is a dietary supplement that is designed to help support your weight-management program, and to promote lean body mass safely. According to the manufacturer, this product does not convert into estrogen in women, nor testosterone in men. The main ingredient is 7-Keto DHEA (7-oxo-dehydroepiandrosterone 3B-acetate). 7-Keto DHEA is not to be confused with DHEA, which is a “parent hormone”. Unlike DHEA, 7-Keto DHEA does not convert to estrogen and androgen. It is claimed that it accelerates metabolism, which helps promote weight loss and lean body mass. It might also be able to improve cognitive function and slow down aging. Other ingredients: Gelatin, calcium palmitate, and microcrystalline cellulose (plant fiber). The recommended dose is 1 capsule taken with water, two times daily. Individuals who are pregnant or nursing should not take this supplement. The manufacturer sells Swanson 7-Keto for a discounted price of $11.49 on their website, which is much cheaper than other similar products. The normal price is $12.99, which is still very cheap. It appears to be available from third-party retailers as well. However, when we clicked on the title the system showed a message saying that they do not have the product. It does not say it is out of stock, which might mean that they do not sell it. We did not come across any information regarding a money-back guarantee. It seems that they do not offer one. This is a concern because it puts the customer at risk. Even though the product has worked for some individuals, it does not mean that it will work for everyone. You run the risk of losing your money if you do not benefit from this product because you will not get refunded by the manufacturer. 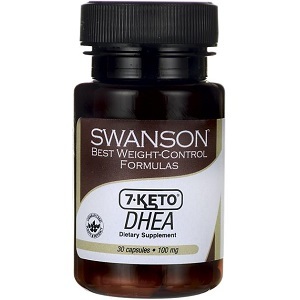 Swanson 7-Keto DHEA seems to be a promising product, and it might be helpful in supporting and promoting weight loss and building lean mass. We like that the price is affordable, and that the manufacturer still offers discounts despite that the price is already low. However, it is even much lower when compared to similar products on the market. This may not be good to some individuals because low prices are often associated with low quality. Furthermore, the manufacturer does not offer any guarantee to customers who are unhappy about the product. This is another downside because it is not wise to buy a product that is not backed by the manufacturer’s guarantee, as you cannot return it and ask for a refund if it does not work for you. Another thing that we do not like about Swanson 7-Keto DHEA is that it is only available from the manufacturer. We looked for it on third-party retailers websites with no luck. If there is a technical problem on the website of the manufacturer, you would need to wait for it to be fixed for you to be able to buy. We recommend that you rather look for another product that has better qualities than this one. John Parker	reviewed Swanson 7-Keto DHEA	on February 19th	 and gave it a rating of 2.5.